With a simple phone app you can donate your idle phone time to science; and if researchers decide to use this data in a paper, you’ll also be credited as an author. 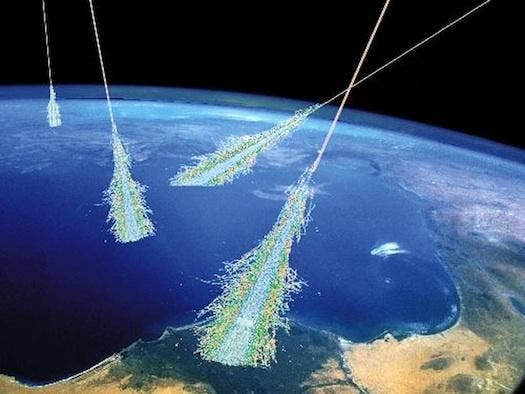 This is an artist’s conception showing cosmic rays hitting the Earth. When they reach the Earth’s atmosphere, the rays trigger showers of particles called air showers. In this illustration, the air showers are the branching, broom-tail portion of the rays. Simon Swordy, U. Chicago, NASA. The app is called Cosmic Rays Found in Smartphones, or CRAYFIS – and all you have to do is download it, it takes care of the rest. What it does is use your phone or tablet’s camera to detect some of the super-rare particles that shower down on the Earth when a high-energy cosmic ray hits the atmosphere. The app collects the data and then sends it back to physicists at the University of California’s Irvine and Davis campuses for analysis. It works somehow like a screensaver – when your device is plugged in to a power source and the screen is shut down, the app begins data-taking. No active participation is required on the part of the user after the initial download and installation. Pretty neat. It’s not the first app of this kind – there have been several other apps which use your smartphone’s idle time to gather scientific data (for example SETI@home, which has been running for more than 10 years – on computers in the beginning). You can send your data publicly or anonymously – however you shall desire. But if you submit it publicly, there’s a potential perk: if your phone records interesting data which the scientists decide to include in one of their studies, they will name you as one of the authors. “Modern smartphones contain high-resolution cameras with digital sensors which are sensitive to the particles in a cosmic ray shower. They know where they are (GPS) and can upload their data (wi-fi). Most importantly, there are 1.5 billion active smartphones spread across the planet. Essentially, this detector has already been deployed; all that is missing is the app to collect the data”, the authors write on their website. The thing is, cosmic rays hit the Earth all the time, but researchers still don’t know that much about the highest-energy rays. Where do they come form, how do they occur, and what information do they yield? All these are unknown questions which you can help answer – without doing anything; and if you get lucky, you just might get credited in a high level peer reviewed scientific paper. So what are you waiting for – download the app and do some science!